All flying training is with Brendan on a one to one basis, whole days only. His avowed crusade is to produce aviators and not aerial “car drivers”. If the latter is what you want there are plenty of straight and level flying factories to choose for your production – some decidedly better than others! If you want FREE personal advice before you embark on your flying career then please contact us for information. . Even if you have already been “trained” BUT realise that there is a world beyond 30 degrees of bank and/or 20 degrees of pitch - for your own sake and the sake of those innocents you might fly, you really should know something about the outer edges of the flight envelope of your aircraft and you should learn something of your own personal limits! All training is tailored to the individual, including your choice of licence type, aircraft and location. It is a personal service on a one to one basis. Brendan gives whole days of instruction only. It is with the continuity of whole days of instruction that rapid progress is most often made. 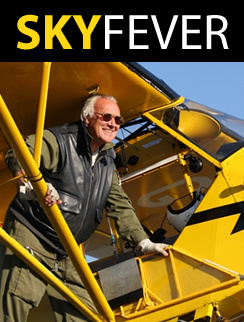 Please note ALL flying licences provided by Skyfever and Brendan O’Brien ultimately allow YOU to go out and with maximum possible safety - TEACH YOURSELF TO FLY! Most people are physically well suited to flying though as the years roll by it becomes harder and takes longer to learn most things. However, some people are psychologically unsuited to flying. You need more than a top gun ego and a disposable income to be an aviator. Dream by all means but be honest with yourself. Please contact us for pricing.